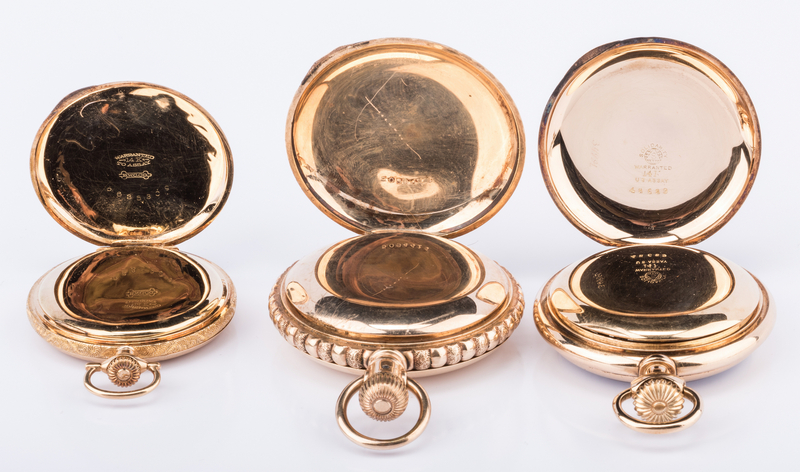 One Waltham 14K railroad pocket watch, one Elgin 14K hunting case watch and one Elgin/Fahy gold-plated hunting case watch. 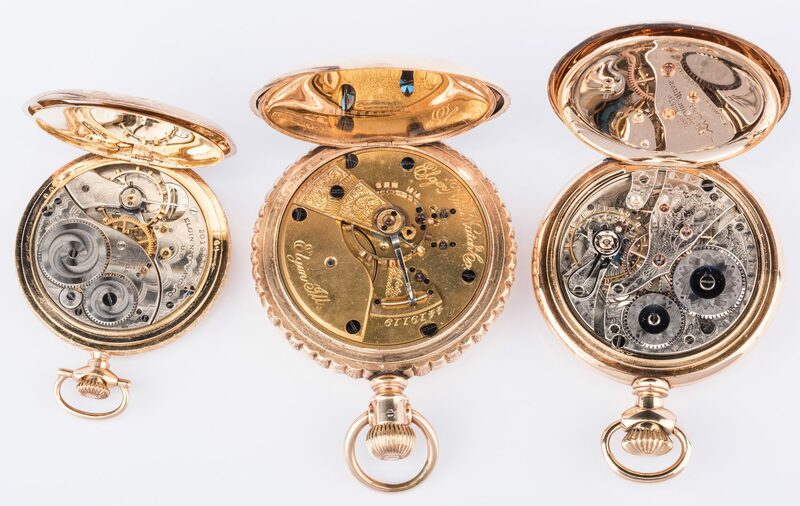 1st item: Waltham railroad pocket watch, 14K yellow gold case, case number 48689, white enamel dial, Arabic numerals, red fives, spade hands, marked: Warranted 14K US Assay, plain hinged back with dust cover, 2 1/8" W case, Watch movement 14049475, 23 jewels, A.W.W. Co., Waltham, Mass. Riverside. 108.8 grams total wt. Early 20th century. 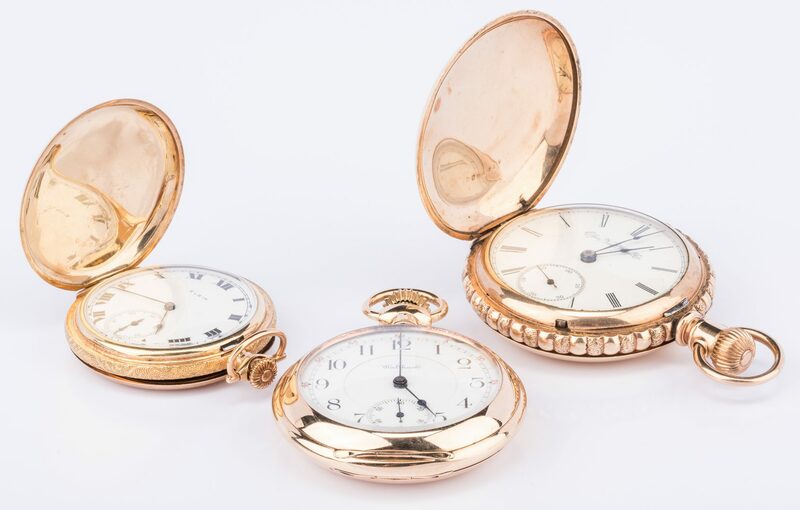 2nd item: Elgin National Watch Company hunting case watch, 14K yellow gold case, case number 6636309, white enamel dial with secondary dial, Roman numerals, spade hands, marked: Warranted 14K to Assay B.W.C. 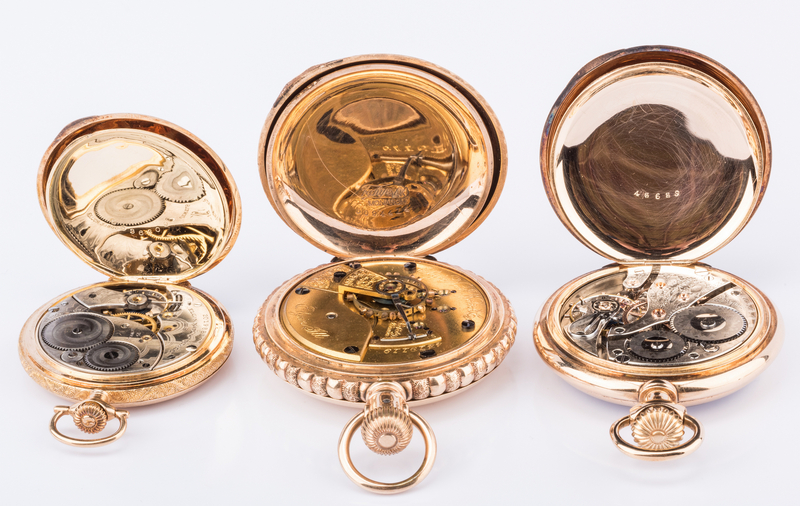 Co., two hinged covers with satin and bright lines, floral and scroll decoration, dust cover, 1 3/4" W case, Watch movement 20198817, 15 jewels, Elgin National Watch Co. USA, 61 grams total wt. Early 20th century. Monogrammed "WR" on front of case. 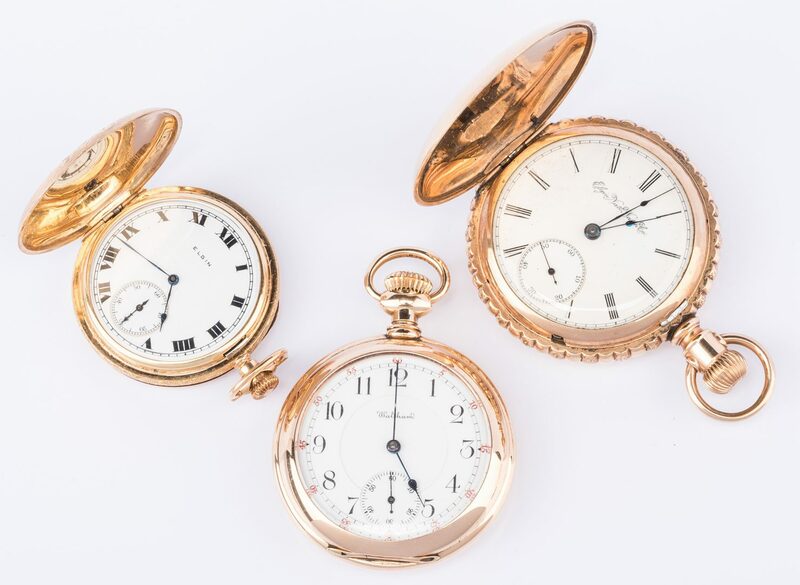 3rd item: Elgin National Watch Company hunting case watch, gold-plated case, case number 5094414, white enamel dial with secondary dial, Roman numerals, spade hands, marked: Fahys 14K Monarch, two hinged covers with scroll and floral pattern, cover and beaded rim, 2 3/16" W case, Watch movement 4419119, Elgin National Watch Co., Elgin, Ill. 135.8 grams total wt. Late 19th century. 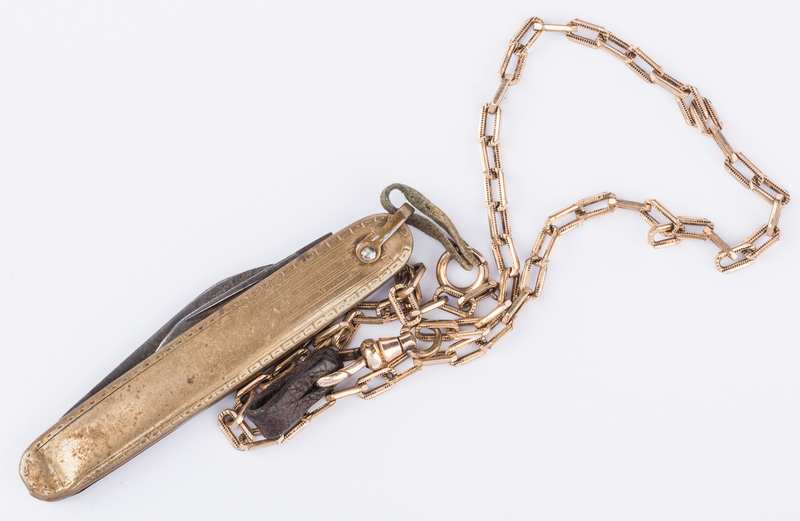 One goldplated watch chain with attached goldplated pocket knife is included. 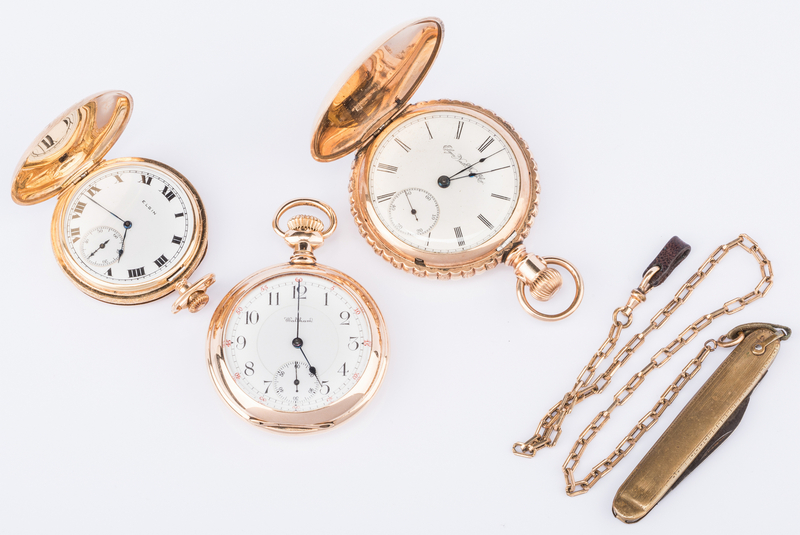 (4 items total) Provenance: The Living estate of John and Donna Rogers of Greeneville, TN. CONDITION: 1st item: Running at time of inspection. Case in overall good condition with some surface wear. 2nd item: Not running at time of inspection. Small monogram on cover. 3rd item: Running at time of inspection. Case in overall good condition with some surface wear.